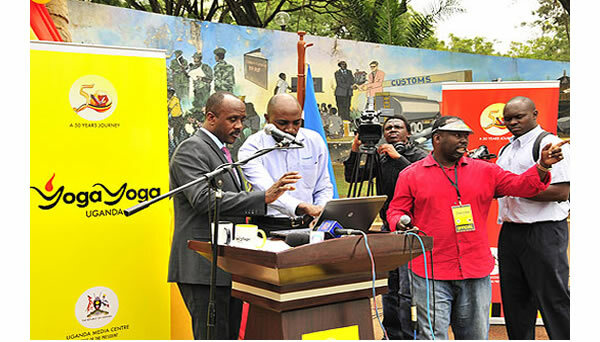 The Government Wednesday launched an official jubilee song titled “Yoga yoga Uganda” at the Independence monument in Kampala. Uganda’s world music icon, Richard Kaweesa, through his Spirit of Africa group officially launched Uganda @50 jubilee song to commemorate 50 years since Uganda got independence in 1962. The song, titled “Yoga yoga Uganda”, (sounds of jubilation) has a melodic and melancholic feel; it got the President whistling after presidential advisor, Teclan Kinaalwa, and his organizing committee gave it a seal of approval. The song features artists like Hum Kay, Richard Kaweesa (Richy), Esther Nabaasa, Luyonga and Barbara Kayaga sponsored by the Uganda Media Centre and office of the president. The occasion was graced by the State Minister for Economic Monitoring in the Office of the President Hon. Henry Banyenzaki who represented Hon. Muruli Mukasa, state minister for presidency. Hon. Banyenzaki commended the artists who composed the song and assured them of continuous government support. He also cautioned the youth to be vigilant and take care of themselves in order to witness Uganda’s next 50 years come 2062. The Executive producer Spirit of Africa Limited, Richard Kaweesa says 25% of the revenue raised from the sale of this song, its related merchandise and performances will go towards supporting children with intensive care needs as well as supporting character development initiatives among students. the song will be accessed and downloaded for free. Please Richard Kaweesa, we need a video to this song. please please please! Its too good.